I’m always on the look-out for ways to diversify my portfolio. I also like to keep costs to a minimum. I was therefore interested in Vanguard’s global income ETF when it was launched just over 2 yrs back. The FTSE All-World High Dividend Yield (VHYL) holds over 1000 higher yielding large and mid-cap companies listed all around the world. The largest weighting of 37% is USA followed by UK 12.3%, Switzerland 6.3%, Australia 4.7% - also France, Canada, Germany, Japan, China and Brazil. Top 10 holdings are Exxon Mobil, Microsoft, Johnson & Johnson, General Electric, Nestle, JP Morgan Chase, Novartis, Procter & Gamble, Pfizer and Roche. As with funds, all income is distributed so can be lumpy and unpredictable. For example, during the year to end June 2014, the distribution was $194.63 whereas over the past year the distribution has reduced to just $156.60 - that's just under 20% less in dollar terms. Unlike my investment trusts, I am never quite sure what income to expect at the end of each quarter - also there are FX considerations as the dollar distribution is converted to GB pounds. The current yield is 3.2%. The annual costs are very competitive at just 0.29% TER. My original purchase price in June 2013 was £31.60 and earlier this year I topped up my holding giving an average price of £33.00. Annualised returns for the 2 yrs to end May 2015 are 6% p.a. One advantage of holding this ETF within my Sippdeal ISA is the avoidance of the 0.20% per annum custody fee levied on Vanguard funds. Also, there is no 0.5% stamp duty to pay on purchase. In my original post, I suggested it would be interesting to see how a passive global income index tracker compared with a managed global investment trust like Murray International. The answer so far is - very favourably! 2 yr chart VHYL v Murray Intl. Lets hope Bruce Stout can turn things around over the coming year or two! It will be interesting to see how the income distributions and total returns play out over time compared to some of my investment trusts. 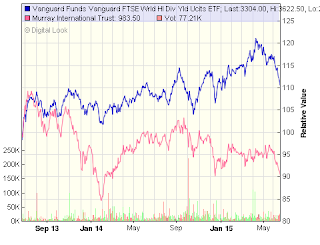 I am also interested to see how this ETF compares to my recently acquired equity/bond Vanguard LifeStrategy. I decided to convert my SIPP into pension drawdown in June 2012. 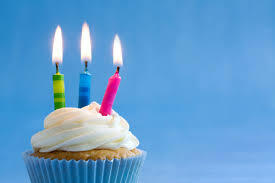 Its hard to believe that three years have now passed and its time for another annual update. The plan is to maintain a rough split of 60% equities from which to generate a rising income which should hopefully keep pace with inflation. This element of my portfolio is comprised of a ‘basket’ of investment trusts. 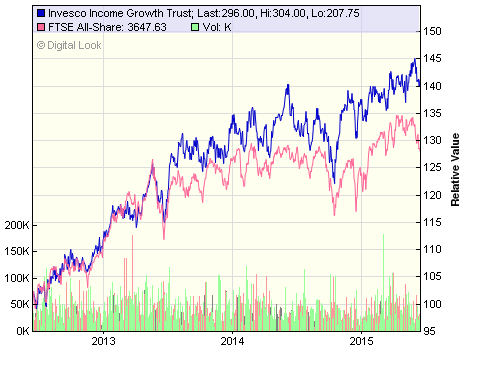 All trusts have managed above inflation dividend increases over the three years. In this regard, the drawdown sipp is an index-linked annuity substitute. The non-equity part of the portfolio consists of the New City High Yield trust and a rather large dollop of PIBS from Coventry BS which is due to mature next June. At this point last year, the total return for the portfolio was 32.6% which meant that over just two very good years, the value of the portfolio had grown to its original starting valuation prior to taking the 25% tax-free lump sum payment. Over the past year, the returns have been more mixed and the performance of some of the investment trusts have been more muted as share price premiums have reduced. Once again there have been no changes to the portfolio. As readers of my blog will know, this is a big contrast to my individual shares portfolio! As can be seen from the end column, I have calculated the 3 yr average annualised return (including income) for each of my investments. Sometimes it can be a little misleading focussing on the income yield alone whereas what really matters over the longer term is total return - capital appreciation + income combined. My holding in smaller companies specialist Aberforth continues to perform well with an average return of over 29% p.a. in each of the past three years. The larger trusts, Edinburgh and City of London have been very solid however I have been a little disappointed with a few of my Aberdeen stabled ITs over the past couple of years - the two Murrays, and Aberdeen Asia Income. The total return including income after 3 years is 43.8% which is very satisfactory. In recent months, I have reviewed my investing strategy and have been moving more towards passive index funds with my ISA - I thought I would just compare how my pension may have performed over the past 3 yrs using say Vanguard LifeStrategy 60 which would reflect the equity percentage for my current sipp portfolio. Over the past 3 years, the average annualised returns (adjusted for platform fees of 0.20%) for the Vanguard fund have been ~10.5% p.a. Assuming I sold some of units at the end of each year to provide an equivalent income, my starting sum of £62,000 would now be worth ~£74,000 had I adopted this route to manage my sipp drawdown. Obviously, the investment trusts have delivered a steadily rising income stream which means I do not need to touch the capital. The overall CAGR after 3 years is 12.9%p.a. - without the boost from smaller companies specialist Aberforth, I suspect this figure would be nearer to the 10% offered by the LifeStrategy 60 fund. The aim of the sipp drawdown is to generate a steadily rising income from my investments to keep pace with inflation. In each year the dividends generated have seen a modest increase - the current return is around 4.6%. In the first two years I withdrew around 20% less than the natural yield in order to build a cash buffer. In the past year I have increased the drawdown amount from £2,800 to £3,250 which represents just over 4% leaving a little more to increase the buffer. Under the new freedoms, I am now able to drawdown as much or as little as required. As my pension is my main source of taxable income, I could withdraw £10,600 tax free this year - this option is currently under consideration. As we all know, there was quite a radical shake-up of pensions announced by the Chancellor in his 2014 Budget. 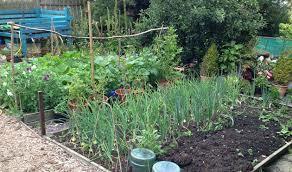 Here’s a link to my post shortly afterwards and a more recent article in March. These changes took effect from April 2015. I have now converted my pension from income drawdown to flexi drawdown which basically means I am now free to take ad hoc payments from my pension for whatever sum I decide as and when needed. I am considering a house move later this year (yes, I know, it‘s only a year since the last move!) and it could be a possibility to use some of my pension towards this although I have decided against the Lamborghini this year. I am reasonably happy with my first three years of self-managing a drawdown sipp portfolio. The dividend income has predictably rolled in very much as expected and importantly, increased each year a little ahead of inflation. 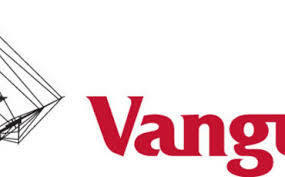 I am pleased the overall result after the first three years which have been a little better than I could have achieved with a simple low cost approach using Vanguard Lifestrategy funds. I will need to give some thought as to where to reinvest the redemption of the Coventry BS PIBS next year but for the time being, I am minded to leave the portfolio to take care of itself - as they say, if it ain’t broke…. It is one of a basket of income trusts held in my SIPP flexi-drawdown portfolio. It is one of the smaller trusts in my collection with total assets of £181m. I generally like to hold the larger trusts as the expense ratio tends to be lower due to economies of the larger operation. Having said that, the expenses for IVI are not too bad for an actively managed trust - 0.90% incl. transaction charges. Furthermore, from 1st April 2015 the management fees have been renegotiated and for the first £150m of market cap, the fee will be reduced to 0.65% p.a. and then 0.55% above this level. The trust has issued its annual report for the 12 months to 31st March 2015 (link via Investegate). On a total return basis, net asset value (incl. dividends) increased by a very acceptable 10.3% over the year - ahead of the benchmark FTSE All Share rise of 6.6%. The trust has outperformed its benchmark index over 1, 3, 5 and 10 years - obviously, if this can continue, its worth paying a little extra in charges compared to the lower cost trackers. Pleasing as this performance appears, it is worth pointing out that the trust holds all UK-listed equities and the UK is a small sector of the global market - less than 10%. Returns for sector companion Edinburgh which holds a more widely diversified portfolio were 16.5% over the corresponding period and the return for the Vanguard LifeStrategy 100 was 15.4% for the 12m to March 2015. The board are recommending a final dividend of 3.75p which will make a total of 10.10p an increase of 2.5% on the previous year (2014 was 9.85p). Dividend CAGR over the past 10 years is 7.3%. The current yield is around 3.5%. The balance of the portfolio is weighted towards FTSE 100 large caps comprising 70%, FTSE 250 23% and the rest made up of smaller companies and some fixed interest. The top 10 holdings have a significant weighting in the traditional big hitters; tobacco - 8.4%, pharma - 7.3% and utilities - 5.5%. Also good to see Next - 2.9% and L&G - 2.9% making the top ten. "The FTSE All-Share Index has risen strongly over the last six years and now stands at an all-time peak level. Although political uncertainty in the UK has been resolved for now, there are other headwinds to withstand in the short term, including weakening demand in the Chinese economy and the political backdrop internationally, but valuations suggest that the long term outlook for returns from investing in the stock market are still attractive. My investment strategy remains intact - I am seeking companies with strong fundamentals, with sensible management whose interests are aligned with shareholders and with a low risk balance sheet. 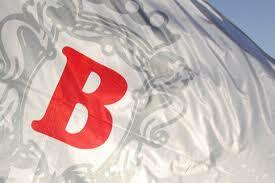 I remain confident in the long term return potential of the holdings in the Company’s portfolio". For those looking for a predictable, steadily rising income, investment trusts can be a good option however, they are not without risk - especially the more highly geared trusts. Over the past year, the borrowing level for IVI has reduced from 9.9% to 8.3%. I am happy to continue with the trust in my portfolio - the only slight reservation is that revenue reserves remain a little on the light side at 91% but have significantly improved from 84% last year. I would be happier if this could be increased to over 100%. Berkeley was added to my income portfolio of shares just over a year ago - here’s a link to the opening post. 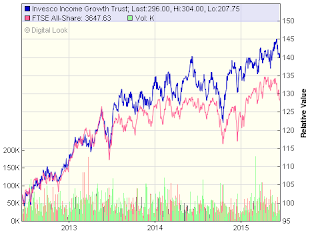 They have today issued results for the full year to 30th April 2015 (link via Investegate). Berkeley has built and sold 3,355 new homes in the past year, less than the year before, but at an average selling price up over 35% to £575,000 from £423,000, which has driven an 30% increase in revenues to £2.12bn (2014 £1.62bn). Pre tax profits are up over 40% at £539.7m (2014 £380m) and earnings (diluted) are up 18.8% at 263.6p per share (2014 221.8p). The board have declared a further dividend of 90p payable in September 2015. The Group have a strong balance sheet and have remained ungeared throughout the year, with net cash rising from £129.2m to £430.9m. The company said domestic demand was strong in its core markets of London and the south of England, and the developer has experienced sales price increases in line with those reported in the wider market. "With £3 billion of cash due on forward sales over the next three years and stable market conditions, Berkeley anticipates that adjusted earnings for the current year will be at similar levels to 2014/15, and is targeting the delivery of pre-tax profits in the region of £2.0 billion over the three year period comprising 2015/16, 2016/17 and 2017/18. 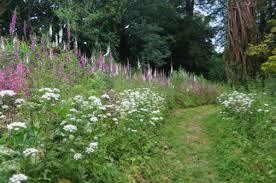 Berkeley has the land, forward sales, balance sheet and people to achieve its targets. We are well positioned to pay the 433p of scheduled dividends equally over the period to September 2018 and build a successful and sustainable business for the long term that maximises returns in a cyclical market." At the time of posting, the results have been well received and the share price is up around 8% at £34.20 - despite the strong surge in the shares in recent months, the dividend yield is still over 5%. Berkeley Group’s market cap is now over £4.5bn - if it continues the current trend, it will become a candidate for admission to the FTSE 100 at the next reshuffle. At this point last year the shares were changing hands at £21.80 and I was tempted to pick up a few further shares to add to my original purchase - but sadly I did not. Since then the price has risen by over 50% and a further 7% paid in dividends. Clearly a strong set of results and happy to continue holding. In recent weeks I had been giving a little thought to the cost of my revised strategy of holding some of my portfolio in funds as opposed to shares or investment trusts which I will leave with Youinvest. In the end, I selected Halifax Share Dealing as they offered a flat annual platform charge of just £12.50 which worked out significantly cheaper than the 0.20% fees I would pay with AJ Bell. On 28th May I placed an order for the sale of my Vanguard LS funds with Youinvest and a few days later the cleared proceeds arrived in my account. It then took a further week for the funds to be transferred to my bank. In the meantime, the online application for my new ISA with the Halifax was very straight forward and it was up and running in a little over 48 hrs. The sale proceeds were finally received earlier this week and I was then able to transfer this to the Halifax which was instant and I placed an order for the new purchase. Today I have received my contract note from Halifax confirming the repurchase of Vanguard LS60 in my new account. Fortunately the markets have retreated a little over the past 10 days so I ended up purchasing the fund for around 3% less than I sold with AJ Bell which gets me off to a good start. So far, so good. I may have a look at transferring over my Vanguard UK Equity Income fund at a later date - I was not quite sure when the xd date was so have left this with AJ Bell for the time being. Enjoy the sunny weather while it lasts! 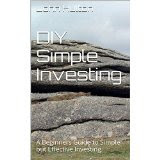 DIY Simple Investing - My New Book!! It is a little over a year since my last book ‘DIY Income’ was published. For the past few months I have been working on a new book “DIY Simple Investing” which I self-published today on Amazon Kindle. It was probably prompted by friends and family, some of whom find the area of investing such as pensions and stocks & shares confusing. My aim therefore was to write a book they could understand and relate to combined with an investment strategy they could easily implement. It is therefore a practical guide to those people who are looking for a low cost, easy to understand, simple investment strategy. The best I could come up with was to use the Vanguard Lifestrategy index funds as the basis for this all-in-one solution. For those who are seasoned stockmarket investors, its easy to overlook how confusing and difficult it can seem to those would-be investors looking at such things as investment trusts, bonds and ETFs - not to mention TER or is it OCF? The introduction of the Retail Distribution Review last year will mean fewer but possibly better qualified advisers who will probably be targeting those who can more easily afford their fees. Meanwhile, those with more modest savings of a few thousand will be increasingly left to fend for themselves and this could be the choice between DIY or nothing. There will be many who take a decision to live for today and let tomorrow take care of itself - it’s a free country so good luck to them. For those who DO wish to save for the future, for a more comfortable retirement, for their children's education, I do not think mere lack of adequate financial resources to pay for an adviser should be a barrier - likewise, I do not think lack of financial education should be a barrier. This book is for these people who, with a little guidance and a few well directed pointers, can achieve a decent outcome from their self directed investing efforts. I hope some of you can help spread the word - please click on the twitter/facebook button below this article to share on social media. Update 6th June - A big thank you to The Investor at Monevator for making it 'Book of the Week' in the weekend round-up!